A 21 hour bus journey which should have taken 14 hours led us from Florianopolis to Foz do Iguacu. We left Florianopolis at 6pm after spending a really relaxing day on the beach, around 9pm however our bus stopped moving, we didn’t really pay attention as we were just listening to audio books and half asleep, however after around 2 hours later I realised we still hadn’t moved an inch and it suddenly clicked we were in a traffic jam, I thought that it must clear soon, and the minutes turned to hours and it was 3am before our bus began to move again. I still don’t know what caused it, there was just a huge stationery tailback on the road towards Curitiba. After the annoyance of the bus journey we didn’t get much of a first day in Foz do Iguacu so after unpacking we met the host of our Airbnb, Frederico. He was a really friendly guy that offered us a free lift to the town centre, even though it was only a few blocks away, we happily took him up on the offer. Frederico explained Foz do Iguacu’s history which was very much revolving around the military before the tourism side from the falls, as well as Paraguay’s military history. He dropped us off at Capitao’s bar where we had some beers and a succulently juicy burger, it was actually really tasty for “pub grub”. After a fairly uneventful first-ish day we woke up and knew we needed to get a lot done, we went downstairs for breakfast where Frederico met us and decided to take us to a fancy restaurant for breakfast as we were currently the only residents of the apartment. It was a lovely buffet style breakfast where we filled ourselves with meats, cereals, cakes and juice whilst Frederico continued to educate us on Foz do Iguacu and the best things to do in this city. 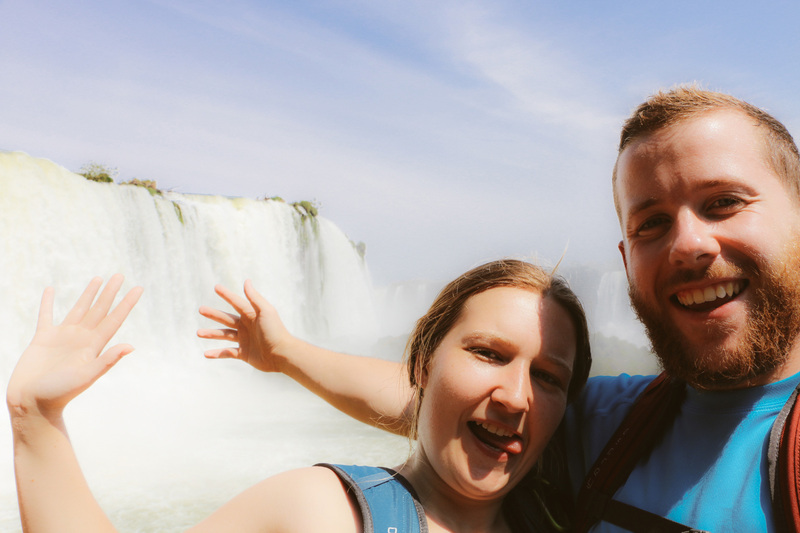 He advised us to do the Brazilian side of the falls first, but also not to miss the bird park, so that’s exactly how we planned our day. I loved this bird park, it seemed fairly animal friendly which usually is a problem with most bird parks, typically the cages are not very large and you feel sorry for the birds. 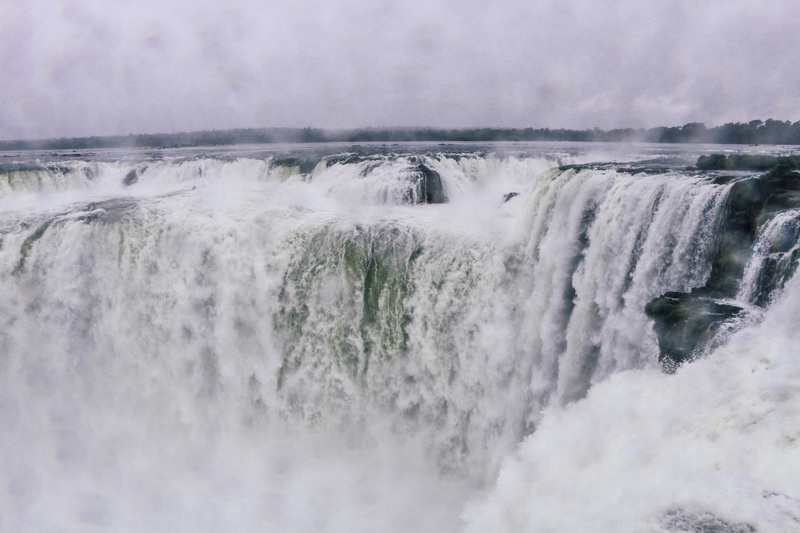 This definitely wasn’t the case with Parque de Aves on the Brazilian side of Iguacu Falls. 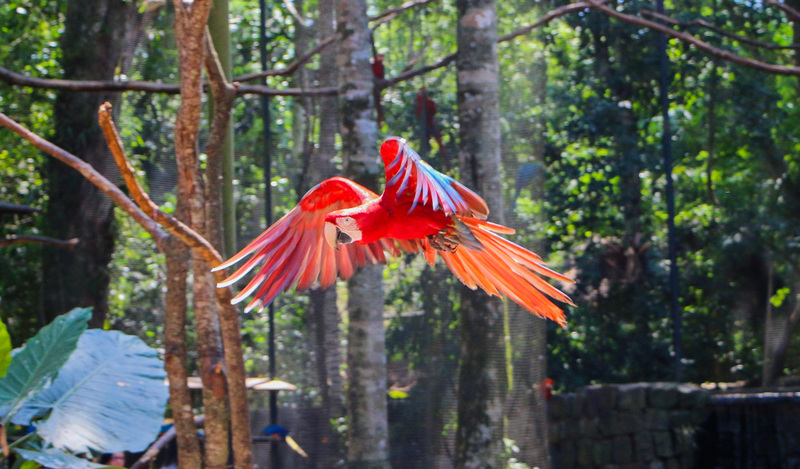 We saw a huge array of birds, from parrots, flamingo’s to toucans and many more. There were even crocodiles and snakes. The best part of this park for us was the large parrot cage that you could freely walk around in, with parrots swooping straight past your head. It was so large you really felt you were just part of the jungle with them around you. 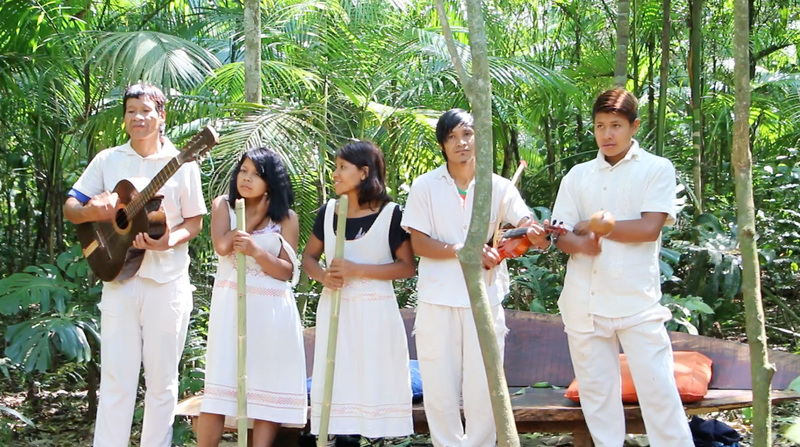 There’s a lot of sad history around South America, mostly revolving around the complete lack of compassion or gratitude for the natives that once happily called these lands their own before getting pushed and butchered out of the way, now there are many attempts to get the natives, such as these Guaraní’s performing traditional songs and dances back to some kind of normality. After the bird park we took the 3 minute walk to the start of the Iguacu falls national park on the Brazilian side, we booked ourselves on the 11:30 bus and had a quick lunch whilst waiting for it, the 20 minute bus journey took us to the beginning of the trial, and as soon as we stepped off the bus we saw what we had been warned about. 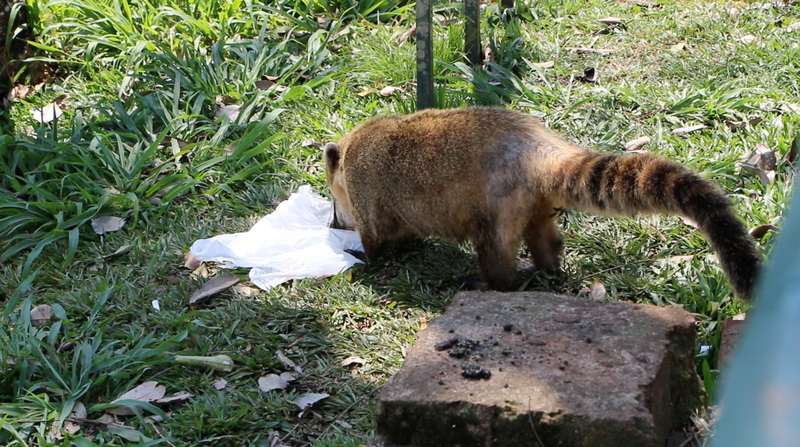 A quati had just stolen a woman’s bag of lunch, these cute looking medium sized animals are the pests of the falls, a huge amount of tourists flooding in everyday has made the quati’s multiply by the thousand and caused them to be very cheeky and unafraid of humans. After skirting our way around a pack of them we continued down the footpath and started to get glimpses of the waterfalls through clearings in the forest tree line. Our first full viewing of one section of the waterfalls was truly eye-opening, just the sheer size and number of waterfalls is incredible, they feel so unstructured, but at the same time so natural. 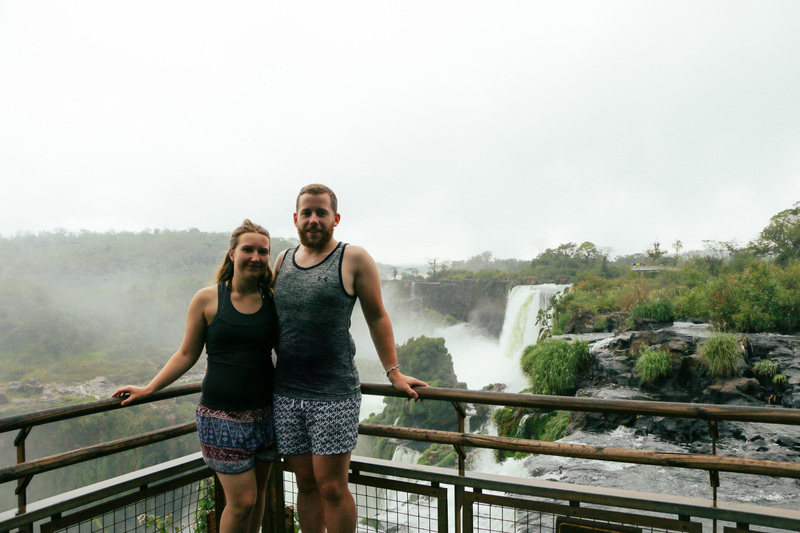 Our walk continued us through meandering pathways and vantage points, eventually to the penultimate point of the devils throat (Garganta do Diabo) where you’re just 20 metres away from the base of one of the larger water falls, covered in the immense spray that fills the air. We opted to take the elevator that takes you to the highest point possible in exchange for a 4 minute wait in a queue, from this view though we really started to realise just how large the falls are, and the true extent of their number. We finished the Brazilian side earlier than we anticipated, so were home by around 5pm, where we managed to fit in some admin/email work before heading out to a Mexican restaurant around 8:30pm. We had heard the Argentinian side of the falls was a much fuller day so we had that in mind and were home by 11pm. On the morning after our first full day we weren’t 100% sure what mode of transport to take, when we chatted to Frederico and told us that an Italian couple had arrived in the bnb and they were going to the Brazilian side and suggested we could use one of the turismo (semi-private/public) taxi’s and share with them. We took his advice and got in the taxi with the Italian couple and Fernando, the taxi driver. Little did we know through our trip in Foz do Iguacu Fernando would become our private tour guide for all taxi journeys and despite being 100% Brazilian, we had a strange moment when he asked us where we’re from and he proclaimed he had spent 2 years in Aberdare (Wales) as a church football coach! After dropping the Italian couple to the Brazilian side, we crossed the Argentinian border and made our way to the national park. This is where our breathe was truly taken away, all of the advice to tourists is to do the Brazilian side first, as that gives you the rough overview, and then Argentinian side as that gets you really into the thick and heart of the cataratas (waterfalls). We can completely back this advice, the Argentinian side is really indescribable, and as cliche as it sounds it really is a place you have to visit to get a grasp of. There’s no real way of giving a photo or description that does it justice; the waterfalls are so numerous and not to mention some of them are hundreds of metres high. Our first stop on the Argentinian side was to a jeep tour that took us through the jungle for 20 minutes before we began our speedboat trip down the river, where eventually they took us directly beneath two of the huge waterfalls, getting us completely soaked, it was strangely refreshing. We then spent 8 hours walking the differing routes, from the lower path that guides you amidst the crashing waterfall spray, middle paths where you get to walk on bridges on top of some of the smaller waterfalls and get a great experience of the forest and small wildlife, to the upper trail where we got to experience the true power of the larger falls, before eventually taking the train to the very top of the falls. Here meandering and graceful waterways violently crash and merge into the Devil’s Throat that we had visited previously from below on the Brazilian side. From above on the Argentinian side the Devil’s Throat had a different kind of power to it, the sheer amount of water constantly cascading over the edge is truly remarkable, it’s incredible to think that water is billowing over the edge 24 hours a day, all year long. After finishing up our full day of walking for 8 hours through the Argentinian side Fernando picked us up and took as to the Triple Front, the area of the Parana river where 3 countries meet: Argentina, Brazil and Paraguay. Our last day in Foz do Iguacu we thought was going to just be a relaxed day around the town as we planned to get a bus to Asuncion in the afternoon. Frederico however gave us the suggestion to take the night bus to Asuncion which gave us a full day in Foz do Iguacu and also saved us a night’s accommodation costs as we would spend it on the bus. We took this advice and booked the bus for 12am. 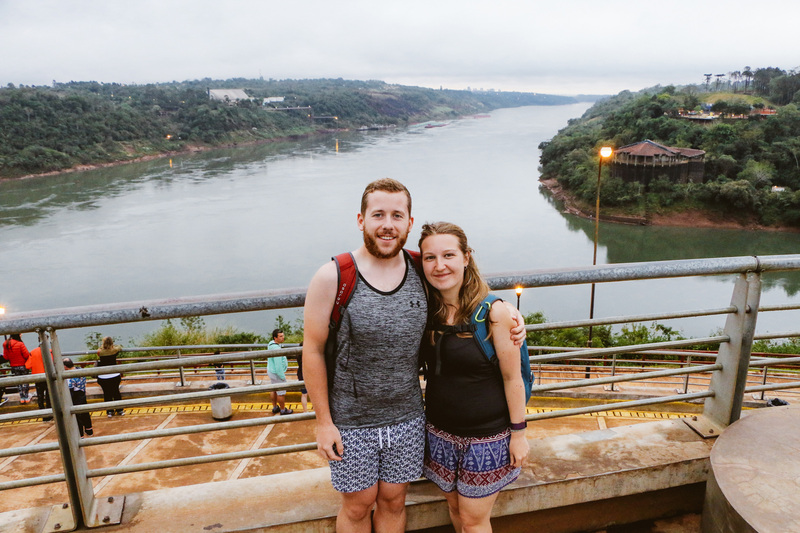 Fernando picked us up once more and took us to Itaipu Dam, this was one of those rare experiences for me personally where I had no idea how much I’d enjoy it. Sometimes I will watch a film without even reading the description nor watching the trailer, and that lack of prior knowledge somehow makes it a much more thrilling experience. That was certainly the case with the Itaipu dam, I knew from a quick conversation the day before that it was a large hydro-electric dam and it was in Foz Do Iguacu.. but that was it. We opted to do the “special tour” which took us firstly along the top of the dam, with viewings across both sides, to our right, where once just a river laid, is now a huge “lake” that is larger than all of Sao Paulo, and to our left a 100metre drop to the normal river. Once inside the dam we learned a load of interesting facts, such as it’s the 2nd largest hydro-electric dam in the world generating 14,000 MW, and once was the first largest, the Chinese having built a larger one lately, however Itapu Dam is still apparently higher, just not quite as long. The dam provides 75% of Paraguay’s electricity needs, and a huge amount of the required energy for Rio and Sao Paulo. The dam was built to be 50% ownership to Paraguay and 50% to Brazil, which leads to some quirky setups. 20 waterpowered turbine generators produce a huge amount of electricity, 10 running at 50hz for Paraguay and 10 running at 60hz for Brazil. As Paraguay only actually needs around 20% of the dam’s electrical output, Brazil has to technically buy it from Paraguay and it gets transferred back across the dam and converted to 60hz on the Brazilian side. As Paraguay runs on 50Hz electric, where as Brazil is 60Hz, as Itaipu Dam is an exact 50/50 split, the light bulbs on the Paraguay side are all 50Hz, and the Brazilian side.. yup, you guessed it — they’re 60Hz! 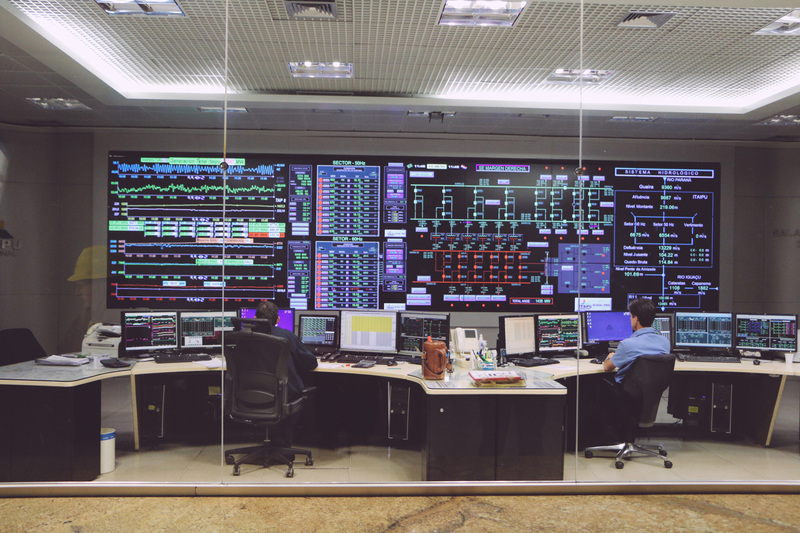 Even the control room in the centre of the dam, there is one worker on the right who is for the Paraguay and one on the left for Brazil! 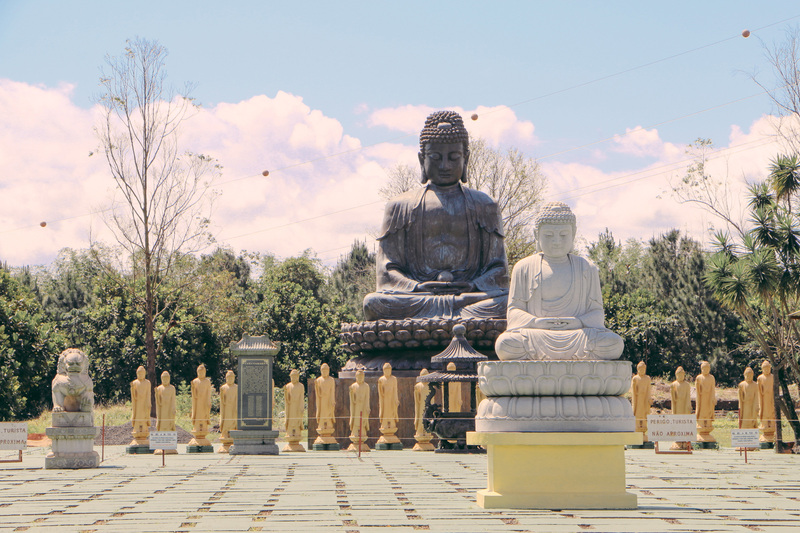 After our educational visit to the Itaipu Dam Fernando took us to get some more culture, this time in the form of a visit to a beautiful Buddhist Temple randomly placed in the suburbs of Foz Do Iguacu, it felt a little odd being here as it didn’t feel completely touristic, with some people praying, however the architecture and design was lovely. We then got dropped off into the town where we had a buffet lunch and ice cream, much to Alis’ delight! For our final evening we went out for a late meal in Pier34 with the Italian couple and Frederico. Frederico was even nice enough to drop us (for free!) to our bus station at 11:30pm and made sure our bus was all in order, and then began our 7 hour bus journey to Asuncion.